Ishan Jalill, IFES Sri Lanka Inclusion Advisor, provided his perspective on disability inclusion for U.S. National DIsability Employment Awareness Month in September 2017. The interview, which has been lightly edited for clarity, is available below. What impact has your work with the International Foundation for Electoral Systems (IFES) had on disability inclusion in Sri Lanka? I think the greatest impact was made in terms of visibility; it was proof that IFES is not only an organization that talks about inclusion but an organization that practices inclusion as well. It was also a good eye-opener for people to realise that a qualified individual with a disability could be engaged in any job that he/she prefers. Connected to this is also the influence it had on the Election Commission [of Sri Lanka]; in terms of understanding what inclusive practices are and also in terms of learning about the real lived experience of disability through me. Disability inclusion is not as distant for them anymore, they are able to relate to me and my experiences and discuss plans accordingly. By the time I joined IFES, there was already a Disability Focal Point at the Election Commission. Therefore, it was easier for me to directly liaise with this Focal Point. I have suggested a coordination mechanism, probably something like a Technical Working Group on Disability, to the Election Commission, and they have responded favourably to my suggestion. I have emphasized the need to ensure the representation of youth with disabilities in this TWG. I also had the opportunity [to contribute] to the advocacy campaigns organized by disabled people’s organizations [DPOs] in Sri Lanka. I represented IFES at the advocacy campaign titled the February 8th Movement, which focused on the law reform process. Furthermore, IFES conducted a Voter Education Programme in the district of Moneragala with a specific focus on disability. 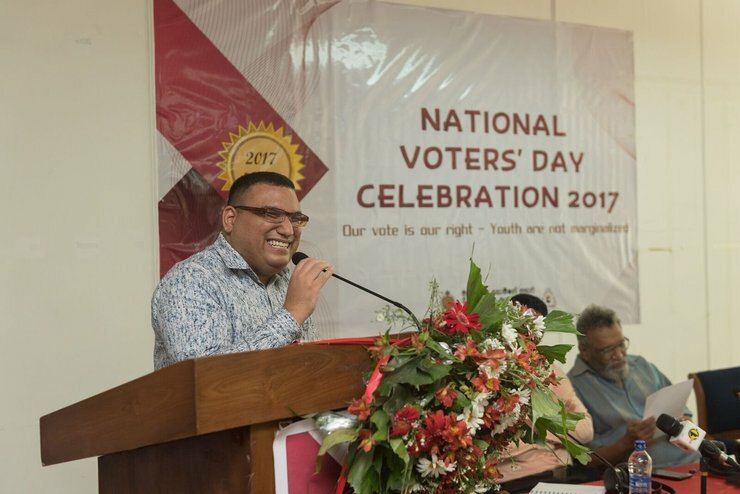 The programme was organized with the support of the Uva Provincial Council and the representatives of the Election Commission in Moneragala. This was a very successful program where follow-up program[s] were proposed. I have also had a number of strategic meetings with disabled people’s organisations and persons with disabilities on the promotion of inclusive elections and also the possibility of encouraging people with disabilities to contest in elections. What is your experience working with youth with disabilities, and how has it empowered them to participate in public life? I have been actively engaged in work relating to youth with disabilities prior to joining IFES. I chaired a project titled ‘Young Voices Sri Lanka’ through Leonard Cheshire Disability for over four (4) years. Through this program, I was able promote the social and educational inclusion of youth with disabilities. I worked with many groups of young persons with disabilities and was able to introduce them to mainstream youth activities. There is a personal story which is a classic example of empowerment; I had the opportunity of getting a young person with a disability named Isuru who, after participating in only one of our youth programs, is now aspiring to be a politician. I am so happy to have inspired him, and I do hope he will pursue his dream. This is proof to me that working with us, and with me as a young person with a disability, has boosted their confidence. What do you think election officials need to know when hiring persons with disabilities as poll workers and staff? If people with disabilities are included in the teams, then there would be more understanding of the accommodations required by persons with disabilities. Reasonable accommodation would be more realistic if people with disabilities themselves point out the required accommodations. It is not about people with disabilities having special needs; it is about making special arrangements for people with disabilities to be included in the process on an equal basis.